The tweet was a bit premature. In fact, the impending snowstorm that hit New York this afternoon caused more problems than we had anticipated. With a late afternoon departure to Europe, we thought we might get out in time before the forecasted 12-18 inches shut down JFK Airport and jeopardized our travel plans. The extra security (including intrusive pat downs) we received at the airport might have been the first ominous sign that this was going to be a long trip. Yet, we boarded on time, got deiced and then sat on the runway for 2 hours. By the time we had made our way to the front of the queue for take-off, our deice time window had expired and we needed to return to the terminal. Meanwhile, the weather deteriorated, raising concern that our flight would just be canceled. Our pilot remained committed to getting us to Germany though. And three hours later, after spending nearly as much time on the ground as we would in the skies, we were airborne for Munich. We touched down at around 12 noon local time, about 4-hours later than estimated, and grabbed a taxi that raced us to our hotel, Le Méridien, in what seemed like record time. 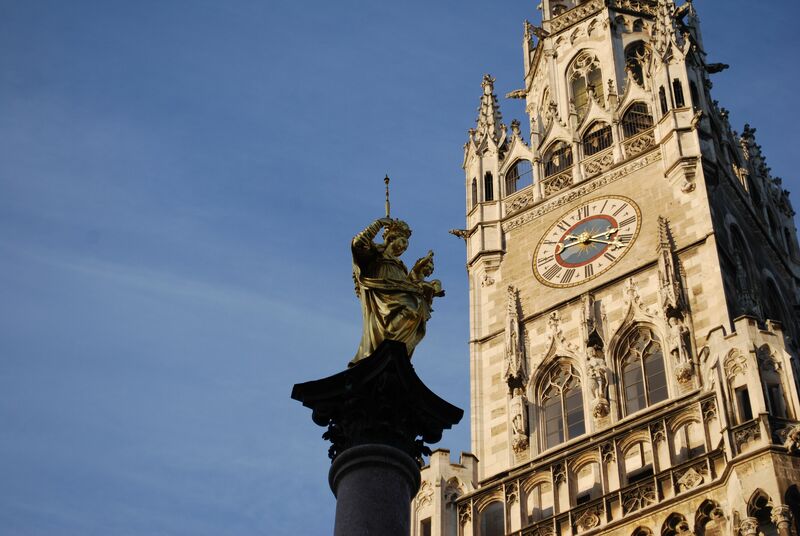 Our location was across the street from the central station, about a 12-minute walk to Marienplatz. Under clear blue skies but unseasonably cool temperatures, we made our way to the hub of old city life here in Munich, passing ice skating rinks and frenzied shoppers. Along the way, we stopped at our first Christmas Market, filled with stalls selling small gifts, crafts — and, more importantly, mulled wine and sausages. Hello, Germany. Unsurprisingly, throngs of tourists were lined up to witness the spectacle that is the Glockenspiel. The thought of standing around to watch animatronics do a little jig while breathing in the icy German Tundra air didn’t appeal to us. Onward we went. We found shelter from the bitter cold at the Deutsches Museum; the largest technological museum in the world, it would be better described as the Man Museum. A couple of hours didn’t do this place justice, but we did see the first Benz automobile, the first diesel engine and more airplanes, helicopters and space ships than we thought could be crammed into a museum. Post museum, we refueled at Hofbrauhaus, the world’s most famous beer hall. With roots originating in 1589, this place has undergone several reincarnations but today houses close to 5,000 drinkers. There’s a brass band, big 1 liter beers and plenty of sausages and sauerkraut. Exhausted from our travels and exploding with swine, we returned to the hotel for some sauna, steam room and jacuzzi action. Adequately sweated out, we collapsed into our soft beds. Like the good youngest brother he is, Peter took the cot.